Experts said Sunday that they do not feel optimistic about the new clean air plan launched by Beijing environmental authorities. Beijing Municipal Environmental Protection Bureau (EPB) will enforce eight measures in 2013, including closing more than 450 high-polluting companies and scrapping 180,000 old motor vehicles to decrease the intensity of major pollutants by 2 percent annually, according to a press release on Thursday. 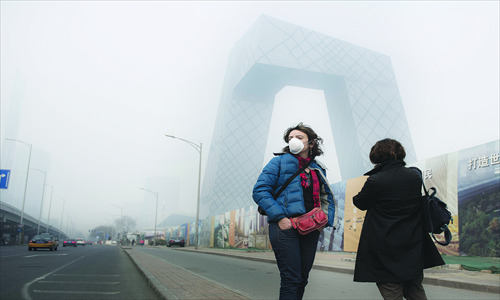 The new plan is based on two Beijing air administration plans issued in 2011 and 2012, which contained similar measures. The EPB also pledged to decrease coal burning by methods such as converting coal-fired heating boilers to use greener fuel, reforest 23,333 hectares of land and strengthen night inspections of trucks laden with construction material. The EPB stressed that management of PM2.5 is its priority, and it will provide the public with updated data through platforms like websites and cellphones. Beijing now has 35 stations monitoring PM2.5. Figures indicating levels of PM2.5 pollution are nearly always beyond the World Health Organization's standard, which should be less than 25 micrograms per cubic meter. Beijing nurse He Shaoqin said that the condition of Beijing's air is a threat to people's health, especially to the respiratory tract. "I think these measures don't tackle the fundamental problem. Beijing was not so polluted decades ago. The most important thing to fight the pollution is to control the number of people and the scale of the city," said He. Zhang Kai, a campaigner with Greenpeace, said that the previous plans have not made a difference in improving Beijing air quality. "A 2 percent decrease in pollution is too low. It's a negative act to set this goal. Beijing's air is so poor that an annual 2 percent decrease is not enough for Beijing to achieve the national standard," said Zhang. Zhang said that even though the goal is low, it is still hard to know whether this can be achieved. "Beijing's air quality doesn't only depend on Beijing, as the high levels of pollutants emitted in Tianjin and Hebei Province have a strong influence," he said. According to Zhang, even though Beijing has decreased coal burning, both Tianjin and Hebei have increased coal use. "So far there is no regional plan to tackle air pollution," he said. Ma Jun, director of the Institute of Public & Environmental Affairs agreed that the effort to tackle Beijing air pollution needs cooperation with nearby areas like Tianjin. "The goal is too low and I don't feel confident about the plan," said Ma, pointing out that his lack of confidence is because fundamental problems which are easier to solve have not yet been tackled. "For instance, the construction dust brought in by the trucks is serious. This problem is easy to solve but no one has done it," said Ma. Ma added that the EPB has never revealed its list of highly-polluting industries and how many pollutants they produce. "The problem behind this is how to punish those who need to be responsible for pollution and how to decide who should take the responsibility," he said. While PM2.5 is the most serious pollution in Beijing, PM10 (particulate matter larger than 10 microns) levels spike if the capital is hit by sandstorms, said Ma. During a meeting of China's legislature Saturday, known as the two sessions, 171 deputies vetoed and 47 deputies abstained the re-appointment of China's environment minister Zhou Shengxian, while 2,734 voted for him, the lowest amount of votes any ministerial candidate received, according to Hong Kong-based news website takungpao.com Saturday. Premier Li Keqiang said Sunday that he feels "upset" about the recent smog that covered much of northern and eastern China, the Xinhua News Agency reported. "To tackle the problems, we need an iron fist, firm resolution and tough measures," Li said as he met the press for the first time since he was endorsed as premier Friday. The EPB could not be reached Sunday.